The singing and dancing of Hare Krishna is known as Kirtan. My spiritual master Srila Prabhupada said, “This is not ordinary dancing; this is the dancing of the soul, a soul awakened to his original consciousness, Krishna consciousness.” There is no motive in performing Kirtan. It is the song and dance of ecstasy, the dance of the soul. The soul is dancing; therefore the body is dancing. Actually, the body cannot dance without the soul. A body without the soul is a dead body. Krishna consciousness is transcendental happiness. Material happiness is temporary. One is happy with a beautiful wife, girl friend, boy friend, bank balance, relatives, house and car. But such happiness is flickering, because these things are material and thus short-lived. We are naturally happy as spirit souls. The soul is ananda. Ananda means bliss. As sugar is sweet and fire is hot, the soul is blissful–ananda. We do not have to look for happiness outside ourselves; happiness lies within. That spiritual bliss of the soul is now covered by this material body made of earth, water, fire, air and ether. Chanting Hare Krishna helps one to understand the difference between the body and the soul. As soon as we chant Hare Krishna, we begin to realise that “I’m not American or German, Filipino or Japanese, black man or white man, fat man or thin man. I am the living force within this body.” Upon realising this, one becomes happy–liberated from temporary and frustrating bodily designations. 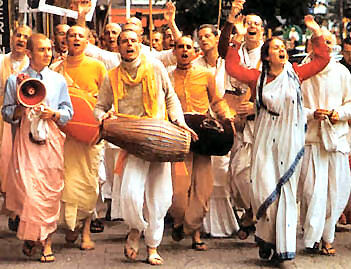 Chanting Hare Krishna is not new; it is very old. 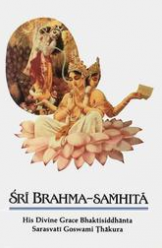 It is recommended and authorised by all Vedic literature, the world’s oldest and most profound books of knowledge. Now the chanting is being spread all over the world. In America, England, Europe, Eastern Europe, Russia, Africa, Middle East, India, Australia, Southeast Asia and China–everywhere–the chanting of Hare Krishna is going on. Krishna consciousness is a philosophy and a way of life. Everyone can accept Krishna consciousness, because every one of us is a servant of Krishna. Now we are thinking that we are Americans, Europeans, Africans, Indians or Asians, but this identity pertains only to the body. The soul within the body is not American or European, not black or white. The soul is transcendental. If we want to be happy and perfect in life, then we have to become Krishna conscious, fully aware of God and our relationship with Him. Krishna consciousness is very easy to attain. One can become Krishna conscious in an instant. It depends on us. We simply have to surrender to Krishna. The process of surrendering begins with the chanting of the holy names of the Lord: Hare Krishna, Hare Krishna, Krishna Krishna, Hare Hare/ Hare Rama, Hare Rama, Rama Rama, Hare Hare. The goal of human life is to become happy. Everyone wants to be happy. People are spending millions of dollars to get a little happiness. Chanting doesn’t cost anything. No one is asking for money. It is free, and it is not illegal. One can chant anywhere–at home or in the temple, in the office or in the bath. One can chant wherever he likes and become Krishna conscious, be happy and go back home, back to Godhead. The purpose of this mission is to spread the chanting of Hare Krishna, because this chanting will make people happy.